Downtown can easily have a simple tribute to Micheal Jackson by recreating the Palace Theater marquee as seen in its cameo in "Thriller". The John Landis directed 14 minute short is considered a benchmark for MTV and Micheal Jackson. It has also kept the song alive for years. Others may call the many versions of Thriller just parodies. Not so. The Elvis hip swing is mocked. The Beatles are imitated. But the dance of head nods, and arms extended up and out while step shuffling to the side are performed with conviction and affectionate participation. As for the performers on the most popular alternative version of Thriller, they were performing for the Philippine International Tourism Fair only a few hours before Micheal Jackson died. After being told of Jackson's death, the inmates practiced for nine hours as a tribute, and performed for a crowd of about 700 locals and foreign tourists. The Thriller Viral Film Festival, after the jump. Dwell on Design's 4th annual 2009 Restaurant Design Awards, presented by American Institute of Architects Los Angeles (AIA/LA), awarded Bottega Louie and Chaya Downtown top category jury prize, while L.A. Live's The Conga Room danced away with the lounge/nightclub award, reports LAist. Pulitzer Prize winning food critic Jonathan Gold and Downtown's bar czar Cedd Moses were among the jury panelists. It's a collective that takes conference dining seriously, and when you see the list of recommended places, one has to notice many have opened in the last 5 years. ..and now you really need a late night snack to be fresh for tomorrow's first 10am session. If a rattlesnake sausage and order of truffle fries at modern German biergarten Wurstkuche (800 E. 3rd St., at Traction) doesn't set you straight, you should have another sausage. And maybe one of the dozens of beers on tap. It's only open until midnight, but that's late by L.A. standards. "And it's cheap!" says Balla. Don't worry, if you don't remember it, you can always can grab a cab back here for lunch tomorrow. GLOVE LOVE: The Grammy Museum sent a late night press release stating they will extend and "repurpose" their just closed exhibition "Michael Jackson: HIStyle" as a tribute to the pop star. . -- The collection of iconic wear includes gloves, accessories, and wardrobe seen on the Thriller album, and will be display alongside video of Jackson's appearances on the Grammy awards. It opens to the public Friday at 11:30 am. . -- THE MUSE IN THE MIRROR: Culture Monster takes a long look at Jackson as art muse and missing mural. 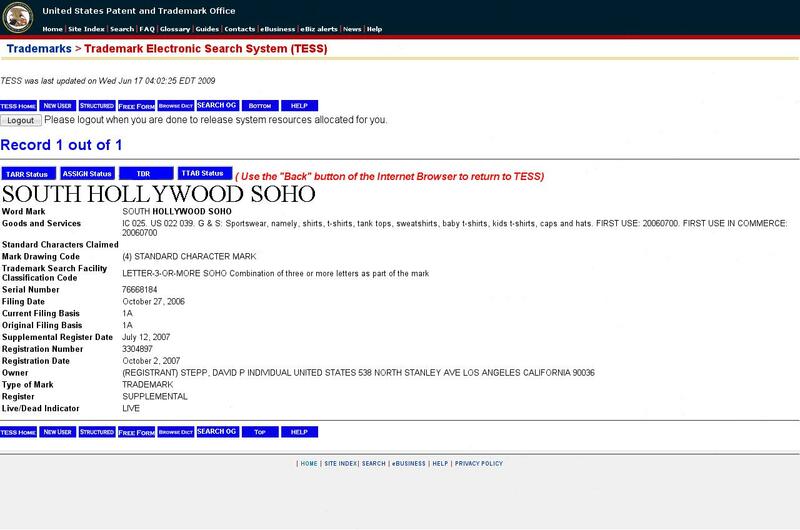 In the MacArthur park area, oy Photo shop was shut on June 23 after the owner, Sung Ok Park, 52, was arrested for “Manufacturing and Distribution or Sale of False Citizenship or Resident Alien Documents,” reports LAPD's blog. LAPD and Homeland Security served warrant at the Joy Photo Shop (2065 West 6th) after an ongoing investigation confirmed the shop was manufacturing and distributing false California Drivers License and Identification Cards, "Green Cards," and Social Security Cards. These fake documents are often used to facilitate crimes such as identity theft, benefit fraud, forgery, juvenile delinquency, evasion of justice and potentially acts of terrorism. It is a known fact that many of Rampart’s most notorious street gangs are financed through these types of criminal enterprises. LAPD is asking anyone with information about this, or similar crimes, to call Rampart Gang Impact Team, Sergeant Richard Lozano at 213-484-3450. After hours or on weekends, calls may directed to a 24-hour, toll-free number at 1-877-LAPD-24-7 or by texting CRIMES (274637) and beginning the message with the letters LAPD. Tipsters may also submit information on the LAPD website www.lapdonline.org. All tips will remain anonymous. It's hard to say if this Broadway store's purchasing manager recently got his hands on inexpensive inventory, or trying to get rid of last years stock. 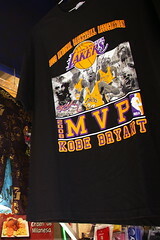 Nonetheless, if you are looking for some leftover 2008 Lakers wear that––and this is just a guess––may not be sanctioned by the NBA, you won't have to look too long or hard if you are on Broadway. Above are the Members of Il Circolo Operaio Italiano (Italian Labor Club) seen posing during a celebration of Italian Republic Day in June of 1919. The banquet took place in the Italian Hall, located on North Main just south of what is now César E. Chávez Ave. The same Italian Hall, which also overlooks Olvera Street, was the social and cultural center for the city's Italians from 1909 to the mid 1930s, making the area our own little Italy back when the El Pueblo was filled with Italian commerce. Because of cultural similarities between Italians and Mexicans, those migrating from Italy and Sicily found Los Angeles less discriminating than elsewhere in the US circa the late 1800s. By 1874, the President of the Los Angeles City Council was Frank Sabichi, and by 1869, Los Angeles was California's wine center, producing four million gallons of wine annually, according to the upgraded Italian Hall website. That backstory will be part of the content the city's first museum of Italian American History, planned to be on the second floor of Italian Hall. Of course, those stories are best introduced and told over a bottle of wine and pasta, so the Los Angeles Historic Italian Hall Foundation will hold the first annual Taste Of Italy at the Pico House on Saturday, June 27 from 5pm to 9pm. While a RSVP deadline is today, organizers told me say you can still go to ItalianHall.org and purchase a ticket up to June 25. Photo Courtesy of the Historic Italian Hall Foundation/Italian American Museum of Los Angeles. What's in a Name? T-Shirts, I suppose. RISE UP FAIRFAX: The torch of El Chavo singes the renaming of southern portions of Hollywood as SoHo, and asks the question of what motivates others to waltz into town and rebrand a neighborhood. During the 1900s, it was to sell real estate. Now, it seems to be about telling t-shirts and sportwear. To sum it up, the area was different. He goes on to mention his Real Estate license (figures), his business of selling SoHo t-shirts, and the need for a “newspaper” that “concentrated on the ‘good news’ of our area rather than the typical doom & gloom of what is now considered ‘news’.” Sure enough, the author that “relocated to L.A. after leaving my home of San Francisco when the dot.com bubble burst” has registered a trademark for that Soho name. I guess it is about making a buck. Keep that in mind next time you start repeating some new name for an area. This is exactly how the term Eastside got drafted into some false “debate”, with some clueless newcomers and some locals that didn’t give it much thought. It’s been a long battle to reclaim our name, and even though we are winning, this should never have been allowed to get out so of hand. Consider this a Public Service Warning. The aforementioned name maker migrated from a region who are quick to disdain, insult, or sniff at Los Angeles . . . unless there's a way to make some cash or find a job (or parking). In this case, he's is one of those who rambled south after the region's industry busted. Gustavo Arellano writes in the comments: "Hipsters in SanTana tried to rename one of Orange County’s oldest barrios last year until we shamed them out of the idea. Congrats, LA Eastside, on your constant trucha—not just for Eastlos but for ALL of LA’s neighborhood semantics." ADD: Now, Mr or Ms Los Angeles Times map maker; how about placing the Arts District on your experimental map? The Laker band playing "I Love LA" en route to the Coliseum for the final stage of the Laker Victory parade.